Attached to 5.5 cm alligator clip. Please read Terms and Conditions before ordering. Fill in Order Form to submit your order. All products are subject to material availability. All contents in this blog is fully owned by Bum's Handmade. So please credit me and linking back to my original post if you are using my photos. Untuk cek tarif, silahkan kunjungi website JNE. Welcome to Bum's Handmade. I am Claire. I love crafting, especially ribbon crafting. 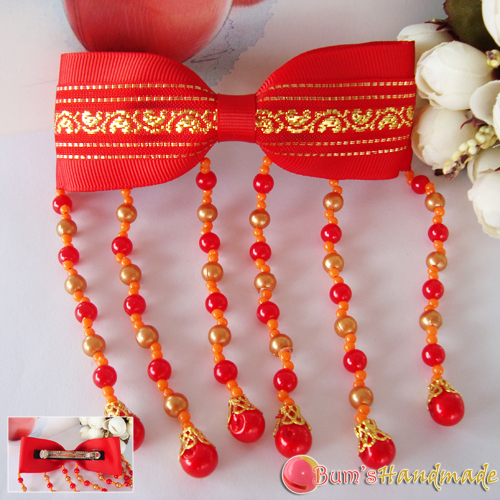 I make hair accessories, some wristbands, and hair clip holder to arrange your hair clip collections. My products (hair clips and wristbands) are suitable for many occasions, from casual to special occasions. Thanks for stopping by my online catalog blog. Happy viewing and Happy shopping! Special thanks to: Bloggershoptemplate, Creating Website by Maskolis, and Helper Blogger.